I didn’t take a bunch of pictures but its not really needed, with only 3 (yes that is correct THREE) ingredients, you can’t go wrong. Put pork in crock pot. Stab pork with a sharp knife all over. Rub salt all over and then sprinkle with liquid smoke. 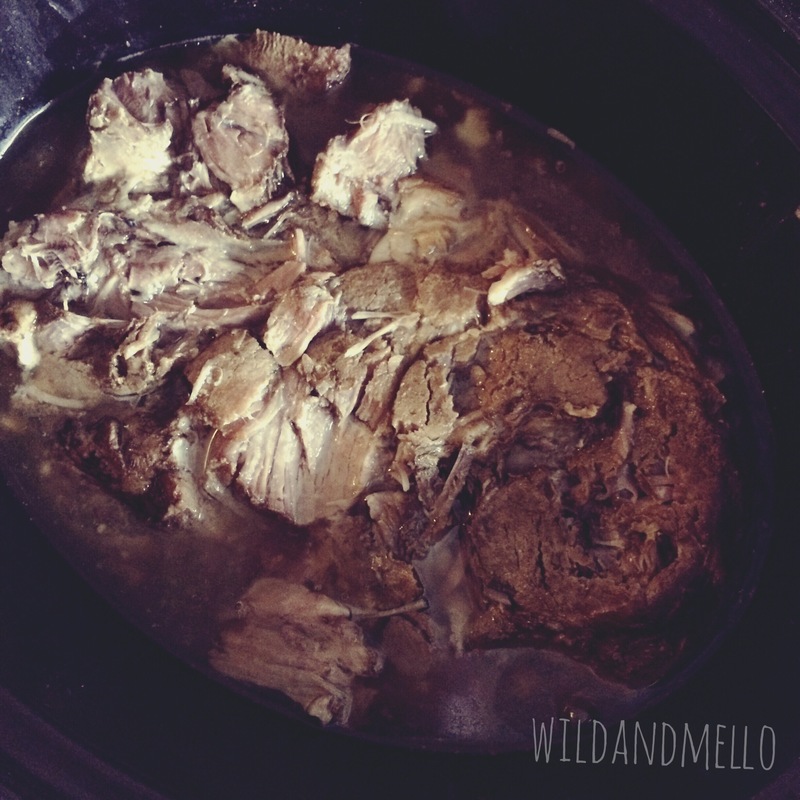 Turn crock pot on low and cook for 8-10 hours, flipping about half way through. Do not add water or any other liquid! The juices and fat from the pork will be enough. It is done when it shreds easily. I decided to add half of a green cabbage to it when it had about an hour left, I just cut it up into large chunks and put on top of meat in crock pot and then put lid back on. Once the meat was done I took it (and the cabbage) out and put it on a cutting board and shredded it. I put all of the liquid into a fat separator and put it in the fridge (the fat didn’t really have time to separate but it did all settle on the top and was really easy to pour out just the juices). I then returned the meat and cabbage to the crock pot and poured the juices back in and it was done! Right before eating take out of fridge and mix in extra spoonful of mayo. I also made a coleslaw out of the other half of cabbage using this recipe from Damn Delicious (except I didn’t have any apple or purple cabbage, that would have made it really good, I just didn’t feel like going to the store). I really like this recipe since it uses only a little bit of mayo and has olive oil and fresh lemon juice. About 20 minutes before the meat was done I also made some white sticky rice. This meal was SO good! 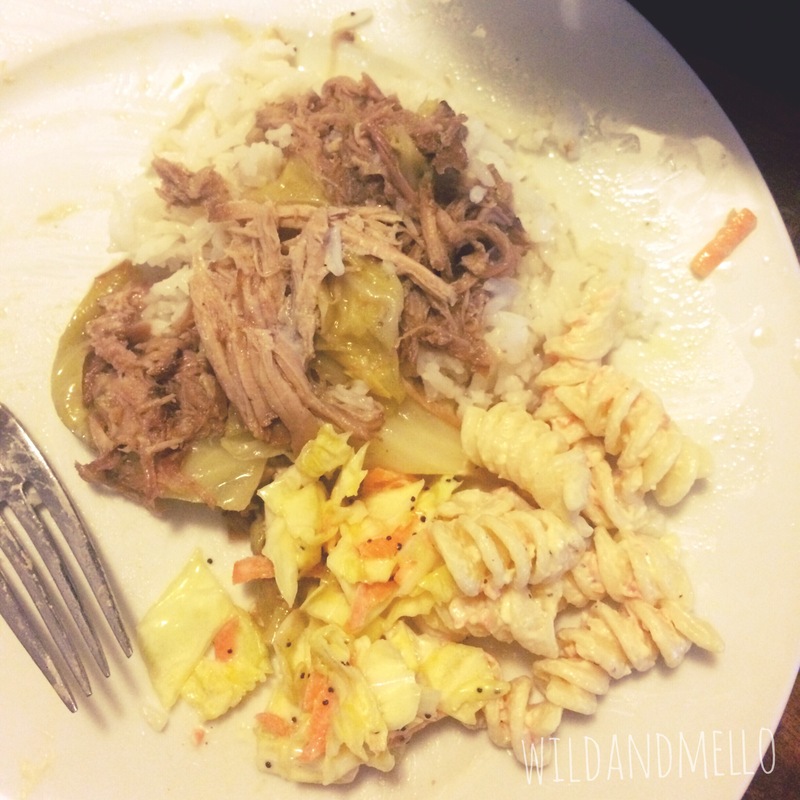 I really liked that the kalua pork was so flavorful but simple and that I was able to make the sides in advance so that when we were going to eat I just pulled everything out and dinner was served!